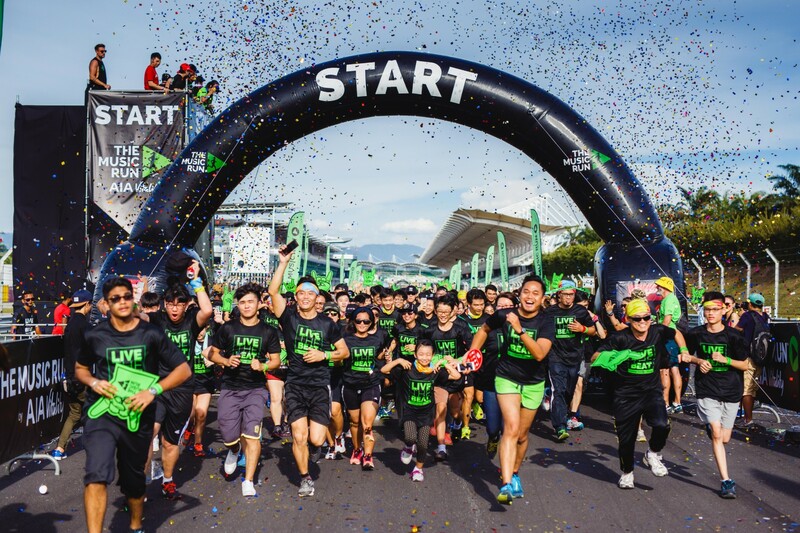 20,000 Runners Conquer Sepang at the Music Run™ by AIA Vitality | JustRunLah! 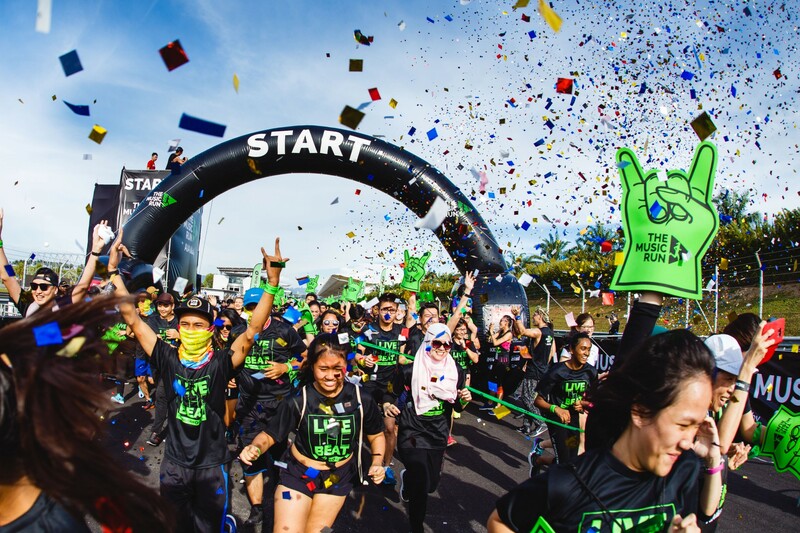 Sepang, Malaysia: The world-renowned Sepang International Circuit rocked to a different beat today as 20,000 Music Runners™ ran and danced through a 5km route – called ‘The Sound Track’ – pulsating with music of various genres. 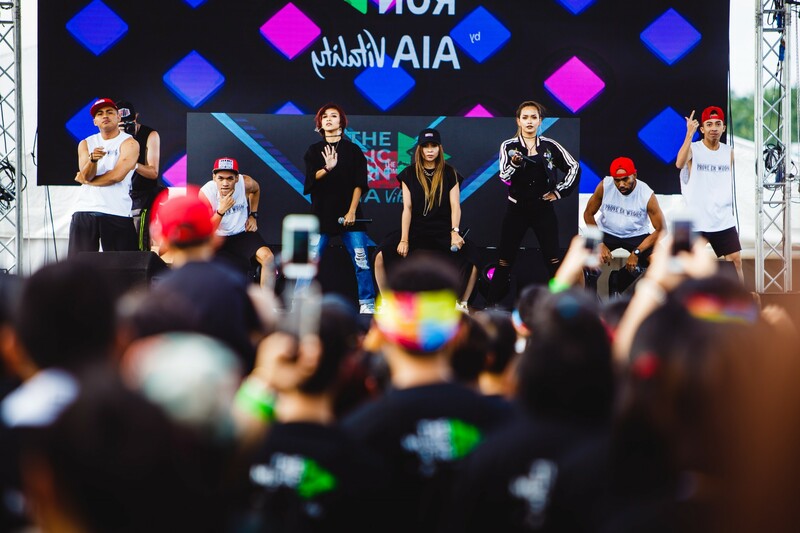 The Music Run™ by AIA Vitality, the ultimate 5k running and music festival, brought the fun back to Kuala Lumpur for the third year running after its takeover in Taipei in September. The Music Run™ is a non-competitive fun run, split into fi¬ve 1km Music Zones – Rock, Pop, Old School, Hip Hop and Dance. Kuala Lumpur played host to the inaugural The Music Run™ in 2014. The event has since been experienced by more than 100,000 participants across 12 events and nine countries from Singapore to Hamburg, making it amongst the fastest growing fun run events in the world. The event kicked off at 3.30pm and ended with a Music Festival, complete with entertainment and fun activities at the Music Village. Presenting Sponsor AIA Bhd. has been instrumental in the growth of The Music Run™ since its Malaysian debut in 2014, helping to bring the phenomenon to other parts of Asia, including major cities like Bangkok, Singapore, Manila and Shanghai. 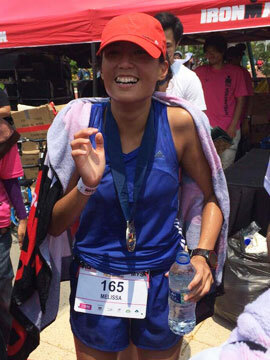 “The KL event has broken its own record by attracting 20,000 Music Runners. As Malaysia’s leading insurer, one that is committed to helping Malaysians live longer, healthier and better lives, we are encouraged to see even more people joining in the fun this year and embracing what it means to be healthier,” Anusha added. The event started on a high-note at the Music Village with a pre-party featuring Malaysian pop-sensation girl group De Fam. The trio, who first exploded into the Malaysian music scene in 2015 with their popular single #Supergirls, enthralled the crowd with their performance of signature tunes including the recent chart-topping hit With You. Pre-race energy levels were further pumped with a Zumba warm up, the much-loved music and dance infused workout. Music Runners™ ran the track that was lined with over 120 speakers, delivering hit songs across the five music-themed zones. In partnership with Spotify, The Music Run™ by AIA Vitality empowers participants to control the soundtrack of the run by voting for their favourite songs in the build-up to the event. Voting was done online via a Spotify ‘Music Voting App’ and songs with the most votes made the official run playlist. Each Music Zone has its own unique playlist entirely selected by the runners. The different Music Zones also delighted Music Runners™ with entertaining activities. At the Rock Zone, runners channelled their inner rock star posing with Harley Davidson bikes. In the Petron Pop Zone, Music Runners™ struck poses with fun photo cut outs of petrol pumps, Pokeballs and Pokestops. In the AirAsia Old School Zone, Music Runners™ splashed around the water fight area and experienced selfie and wefie moments with cut-outs of pop stars and old school bands. Runners also got an opportunity to unleash their creativity on the Graffiti Wall in the Hip Hop Zone, while in the Dance Zone, seven larger-than-life Foam Cannons blasted out foam bubbles turning the zone into a roaring foam party! Music Runners™ also got to try their hand at a slew of fun activities at the Music Village. The AIA Vitality Bag Jump and Dance-Off, AirAsia Dunk Tank, Petron Hangmen Stations and Gladiator Fight, Berjaya Climbing Wall and Sumo Football were clear favourites at the event. This year, Music Runners™ were also treated to the AIA Vitality Takeout by Chef Malcolm Goh, an award-winning chef who created two low-calorie healthy meals for Music Runners™ to enjoy after the run. The takeout meals were created to demonstrate that just like great music is to be enjoyed and shared, food can have the same effect while ticking all the nutritional boxes. Each takeout option was priced at RM8 to rebut the popular belief that healthy meals are costly. A total of 3,000 packs were prepared by Chef Malcom and sold out completely! 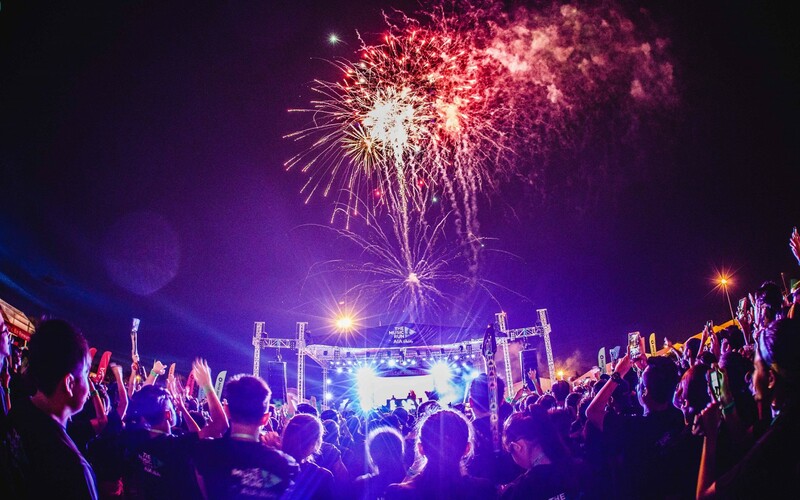 Elevating the Music Festival was DJ Sam Withers of Australia who took to the decks with a set of expertly-mixed dance tracks, served against a stunning backdrop of laser lights and a riveting pyrotechnic show. Withers is a staple at the various Music Runs around the world and brought with him infectious tunes that kept the crowd grooving till the end. Exceed Sports and Entertainment run events in 2016 in Bangkok, Beijing, Kuala Lumpur, Manila, Shenzhen, Singapore and Taipei. For more information please visit The Music Run website (www.themusicrun.com), Facebook (@TheMusicRunMY) or YouTube Channel (@TheMusicRunGlobal).